Dr David Schlect is based at GenesisCare Wesley and also attends GenesisCare Chermside on a weekly basis. David qualified in Medicine from the University of Queensland in 1979 and completed his residency training at the Royal Brisbane Hospital. 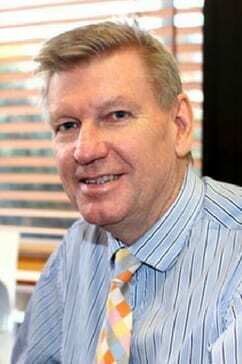 He then went to St Vincent’s Hospital, Sydney, to train as a Radiation Oncologist. This was followed by further training at the Royal Marsden Hospital, London. After attaining his qualification as a radiation oncologist, David returned to Queensland in 1990 and commenced employment at GenesisCare Wesley. David introduced stereotactic radiosurgery to Queensland. David is committed to the psychological support of patients and speaks regularly to community groups on this topic. David’s personal passion is Nelson and Trafalgar and he holds regular Trafalgar Day dinners.